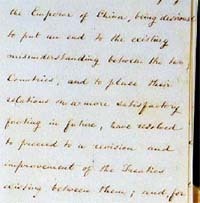 After this introduction, the articles of the treaty would follow, listed as separate paragraphs in numerical order.Some articles would include long lists of things, such as merchandise and how they should be taxed (e.g., the percentage of import duties) or types of merchandise that could be imported or not imported. If you were an ambassador representing your country, as you read each article, you would want to pay close attention to each detail to protect your country’s interests. In addition to trade and commodities, an ambassador would have to be very careful regarding levels of respect reflected in the protocols of communication between the states. Although it is normal for ambassadors to be concerned with terms of respect in diplomatic correspondence, it is highly unusual for any party to draft articles of a treaty specifying the use of language, much less banning any particular word from a language! But this is what happened in Articles Article 50 and Article 51 of the Treaty of Tianjin. Click HERE for HOW IT EVOLVED IN HISTORY.